Ann and Olin have a passion for the arts. They have both served in volunteer leadership positions with numerous non-profit agencies that enrich the lives of those in our community through visual and performing arts and arts education. Olin has served on the Board of the Pasadena Conservatory of Music for many years and led the organization’s capital campaigns to renovate the campus. 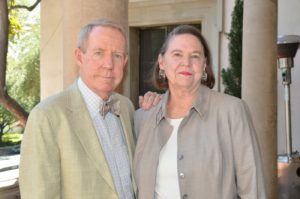 Both Ann and Olin have been active supporters of the Huntington Library, Art Collections, and Botanical Gardens, where Olin serves on the Board of Overseers. Ann has been a long time member of the Pasadena Art Alliance, is a past Board member of the Armory Center for the Arts, and is very involved with Art Center 100. Olin and Ann have a long history with Pacific Oaks College & Children’s School, where Olin is currently a Trustee. Ann was also a founder of Kidspace Children’s Museum. In 2015, Ann completed a ten year term on the Board of the Pasadena Community Foundation. During the Foundation’s 60th Anniversary year, the Barretts set up the Ann Dobson Barrett and Olin Barrett Endowment for Arts and Culture which generates annual grants to local arts organizations. Since then, the Barretts have added to the fund helping to secure a permanent source of funding for Pasadena’s many artistic and cultural organizations.